A fingernail-size frond of pink coralline algae in a tossed-up tangle of kelp and other seaweeds, moved. A seaweed decorator crab. Even in the palm of my hand, this creature didn't look convincing as an animal. five (and I'd never found one before, only pieces) whole Port Jackson shark egg cases (otherwise known as a mermaid's purse). The mother screws the case into rocks. which is why finding them whole is such a special occasion. Usually all that washes up is a thin curve of a piece, a man's big toenail made of tortoiseshell. Half-buried in the sand, they look frustratingly like fine guitar picks. 'The cases are leatherlike,' it is often written, but I think are more artichokelike, and they even dry with a similar curl. The Port Jackson shark is beautiful and harmless unless you are a sea urchin, mollusk, crustacean or a small fish. Actually, that's my common, common name. are actually little colonies of individual animals. haven't checked under the microscope yet. That, by the way, is what I could put under my scanner. A small bush of the thing with a slightly different design is in a bucket beside me, and if I had the right seawater setup, it might live to a ripe 7-year age. Instead, the piece that's pictured is now drying into a precious bookmark. These surprises were found near Jervis Bay, on the southeast coast of Australia. "The crabs are surely the humorists of the seashore." "The Australian coasts seem almost to be one of the world's headquarters for ascidians." 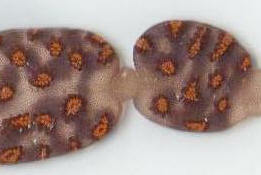 "Sea squirt evolution sheds light on vertebrate evolution"
"The Mary Quant Jelly Thing & other surprises from the sea"